Solid polymer electrolytes based on methyl cellulose (MC)-potato starch (PS) blend doped with ammonium nitrate (NH4NO3) are prepared by solution cast technique. The interaction between the electrolyte’s materials is proven by Fourier transform infrared (FTIR) analysis. The thermal stability of the electrolytes is obtained from thermogravimetric analysis (TGA). The room temperature conductivity of undoped 60 wt.% MC-40 wt.% PS blend film is identified to be (1.04 ± 0.19) × 10−11 S cm−1. The addition of 30 wt.% NH4NO3 to the polymer blend has optimized the room temperature conductivity to (4.37 ± 0.16) × 10−5 S cm−1. Conductivity trend is verified by X-ray diffraction (XRD), differential scanning calorimetry (DSC) and dielectric analysis. Temperature-dependence of conductivity obeys Arrhenius rule. 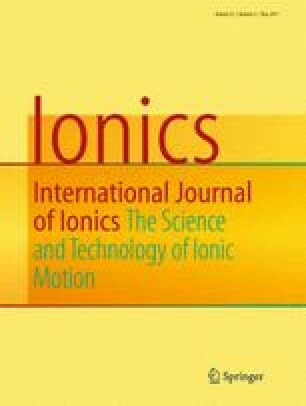 Conductivity is found to be influenced by the number density (n) and mobility (μ) of ions. From transference number measurements (TNM), ions are found to be the dominant charge carriers. The authors thank the University of Malaya for the grant FP009-2015A awarded.